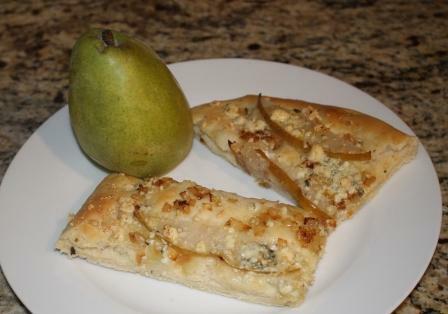 Pears have been plentiful this year and I had to find a savory recipe to use extra pears when I discovered this fantastic recipe. 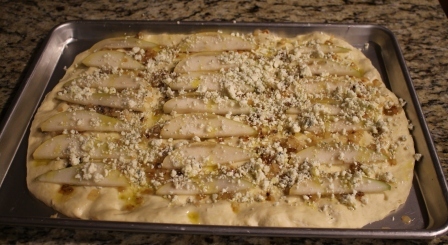 The focaccia recipe itself is wonderful and worthy of a totally different set of toppings; however, it’s hard to beat pears and blue cheese. In a large bowl, combine the water, yeast and honey and let stand for 5 minutes. 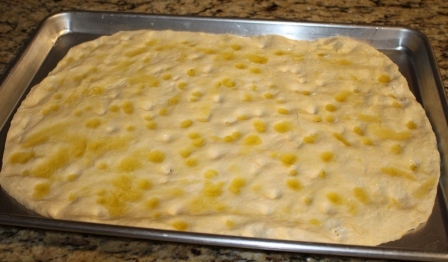 Stir in 1 cup of the flour and 1/4 cup of the oil; let stand for 5 minutes. Stir in the remaining flour and the salt and knead until smooth. Transfer to an oiled bowl, cover with plastic and let stand for 1 hour. Meanwhile, in a skillet, heat 1 tablespoon of the oil. Add the onion, cover and cook over moderate heat, stirring occasionally, for 10 minutes. Add the sugar, cover and cook, stirring occasionally, until browned, 10 minutes.